Stallions host Anglers on Military Appreciation Night! Fifteen, Femton, a cúig déag , 十五. It's been 15 days since the Herd hit the ice for a game, which ironically enough was last played against this Saturday's opponent and nearby rival, the Muskoka Anglers! The Herd had an outstanding showcase tournament down in Potsdam, NY a few weeks ago. 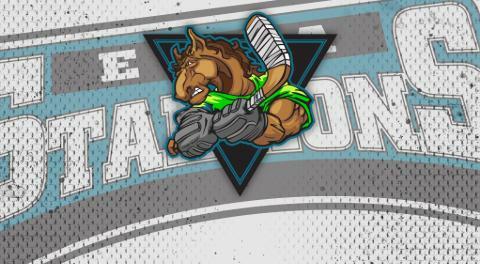 The Stallions amassed 4 wins, 8 points, and only allowed 1 goal in four games, which came versus Muskoka in a 4-1 Herd win. "Our goaltending and d-zone play was outstanding this week. We are a tough team to play against when everyone buys in to the Stallion way, and this week, we were all in. Beautiful thing to watch" said Head Coach and Director of Hockey Operations. "This layoff isn't exactly ideal, but it was in the cards we were dealt, and we have to deal with it. We've had a bit of a break for the boys to re-coup, and have slowly been ramping things back up to get ready for Saturday" said GM and Assistant Coach David Lang. "It's a long season, and you can't be focused day in day out for 6-7 months. You have to let loose and have some fun in those times. Clouts has done an outstanding job in managing the boys time to work and play versus the time to work harder. All we can hope for is when we hit the ice Saturday, we're back in stride and go from where we left off" Lang added. "They are a good team. They work hard, and those are always the toughest types of teams to play against. We have to take advantage of our chances. Set the tone. I'm just as excited as the boys; I just want to get things going again" said Coach Cloutier. The Herd hits a tough part of the schedule starting with Muskoka on Saturday night. After that, they see Muskoka twice more, Seaforth, Maniwaki and Grey Highlands to round out the month of November. "Things aren't getting easier for us. We have some difficult games coming up and we need to be focused and execute the way we know how" Cloutier added. See you at The Barn for 7:30 pm puck drop on Saturday, Nov 10th!